Monrovia, Liberia: The President of the Republic, H.E. 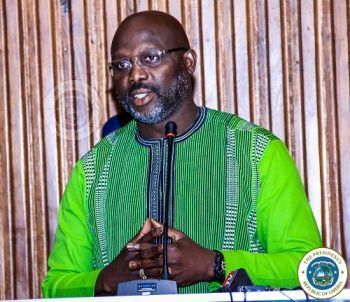 George Manneh Weah, has issued Executive Order #96 containing a number of measures aimed at reversing the protracted downturn in economic activities and slow growth driven by the continuous and persistent declines in the prices of and demand for Liberia’s primary export goods of rubber, iron ore and timber. Measures contained in the President’s Executive Order #96, dated April 10, 2019, affect Work Permits, Residence Permits, Collection of Work and Residence Permits, Surface Rental Fees, Real Estate Taxes and Customs Duties and Import Permit Declarations amongst others. Work Permits, Executive Order #96 declares, shall be issued for a period of up to five years at the option of the holder or beneficiary. The fees for Work Permits shall be assessed by the Minister of Labor in consultation with the Minister of Finance and Development Planning and shall be published by Regulations. The Executive Order also states that Residence Permits shall be issued for a period of five years at the option of the holder or beneficiary and the fees shall be assessed by the Commissioner of the Liberia Immigration Service (LIS) in consultation with the Ministry of Justice. Consistent with the Executive Order, all fees for Work and Residence Permits shall be paid directly to the Liberia Revenue Authority for deposit into the Consolidated Account of the Government of Liberia. From now on, according to the President’s Executive Order #96, a concessionaire shall be liable to pay Annual Surface Rental for unencumbered land only and the payment of the Surface Rental Fees for unencumbered land shall be in accordance with the requisite provisions of the Liberia Revenue Code, as amended. The Encumbrance referred to here are those resulting from legal claims recognized by the Government of Liberia which prevents a contractor from using a portion of the land granted by the Government in the Concession Agreement. The Executive Order also declares that the Commissioner-General of the Liberia Revenue Authority, in consultation with the Minister of Finance and Development Planning, may set forth a schedule of waivers, in Regulation, to be reviewed annually by them for the granting of relief from assessment of penalties and interest related to Real Estate taxes, Customs Duties and related levies, including those under Administrative Review, Judicial Review, Audits or Examinations as a result of either or both failure to file or failure to pay such taxes, duties and levies when due. Executive Order #96 also instructs that all commercial importers of goods into Liberia are exempted from seeking Import Permits and filling Import Permit Declarations, which heretofore have been administered by the Ministry of Commerce and Industry. However, the commercial importers of goods must continue to notify the Ministry of Commerce and Industry, in writing, of their intent to import which written notification shall not be used by any Agency of Government including the Ministry of Commerce and Industry, to circumvent this prohibition against seeking Import Permits and filling Import Permit Declarations. As a further mitigating measure, the President’s Executive Order has authorized the Minister of Finance and Development Planning to, by Administrative Regulation, impose surtax on goods imported into the country that are in competition with local manufacturers and producers. The Executive Order also imposes a reduced tax of 7% from 10% on Travel Agency or Travel Arrangers, on the issuing of tickets for travels that either originate within Liberia or the passengers embarking within Liberia.